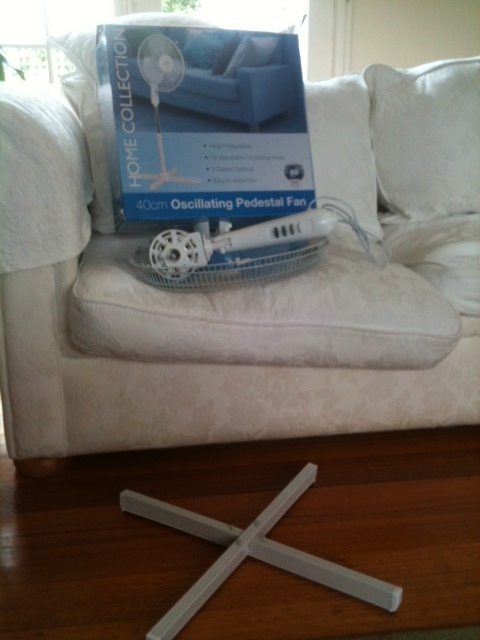 I started to build a fan last night – you know, one of those cheapo made-in-China jobs you can buy at the supermarket. It’s not very hard to put together but, then again, I’m not very handy. I’ve only got as far as making the base or ‘cross stand’ and it’s going slowly as I’m using a $7.99 gimmicky little screw driver shaped like a pen with different heads contained in the pen lid. But with temperatures in Melbourne soaring – it’s currently 42 degrees and there’s no let up until Saturday – and my 82-year-old mother due to arrive from England next week, needs must. Mum’s legs and feet – bless her – are already swelling up (and this in the frosty chill over there) at the mere thought of the interminable plane journey and the heat when she gets here. So I’m doing all I can to make her stay as comfortable and pleasurable as possible. So far, I’ve stocked up on 40% proof gin (and some tonic), red wine, Earl Grey tea and a jar of four fruits jam to go with her toast. I’ve bought a special mattress topper for her bed, cleared away three storage boxes of photos albums (all 38 of them documenting my life from 1963 to 2013) so she will be able to actually get into the bed, and am planning fun things to do and lovely meals to eat. I thought I’d do a cold beetroot soup for lunch on her first day– root vegetables are meant to be grounding (that’s why Bertie dog has a special raw meat preparation with grated turnip and pumpkin), so I reckon that should help her to find her feet even if they have doubled in size. We’ve got quite an itinerary planned. On our first weekend, we’re off to stay with Tim and Bruce in Hepburn Springs (luckily they have a well-stocked drinks cabinet too), then Mum is spending a night in Mt. Eliza with old family friends, she and I are renting a cottage in Gippsland for five days, my brother is taking her to Anglesea and then there are trips to the Botanic Gardens, favourite cafes, favourite friends, sitting in on my Monday night choir and more. I’m thrilled she is coming out and will make the most of every minute we have together. I’m looking forward to sharing aspects of my life in Australia with her. As we reminisce about the good old days, we’ll be creating new adventures and re-stocking our bank of memories and stories. 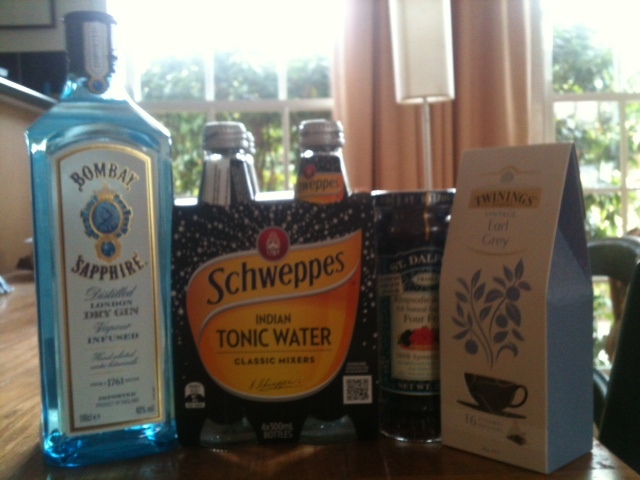 And while I work – how else do I keep the Bombay Sapphire topped up? 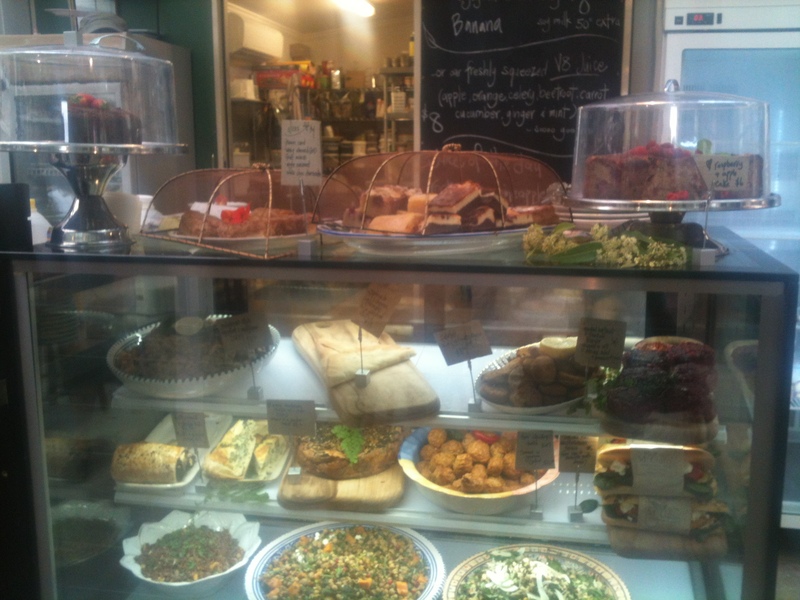 – Mum has said she is happy to help with the ironing, cooking, grocery shopping and pre-renovation cupboard sorting. Perfect! But there are still a few things to sort out. It’s not just the heat we have to worry about. Like many young, energetic and over-excitable dogs, Bertie has a habit of jumping up to greet visitors. And it’s unlikely I’ll be able to train him out of the habit in a week. Mum’s skin is very thin and rips and bruises easily so apart from having a supply of Steri-Strips to hand, I’m recommending that she wear long trousers and long sleeves until Bertie has got used to her being here. 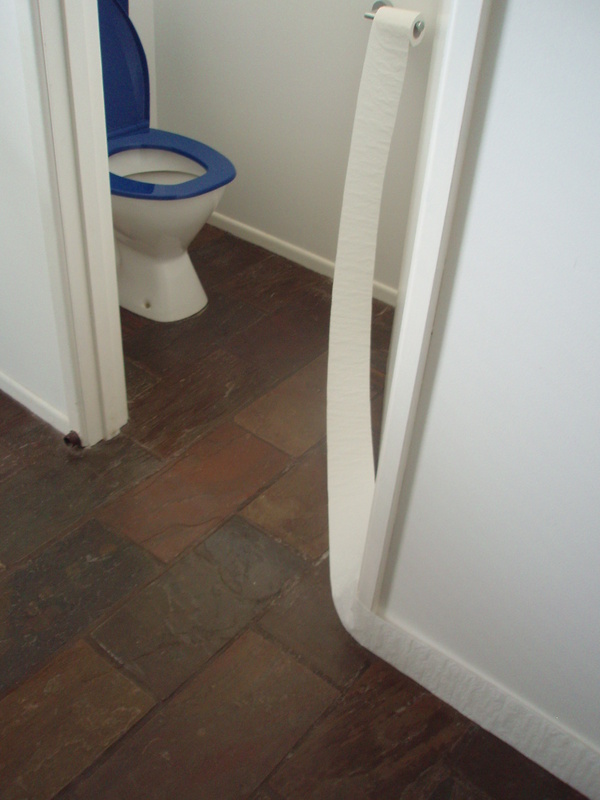 Anyway, by last night I was feeling quite happy with all my plans and preparations… until Dad rang. “Make sure there are no whitebacks or white tails or whatever they are called. I would hate you or Mum to get bitten.” Dad has never forgotten that when he and Mum last stayed here there was a white tail in the bed. Not just on the bed but IN it. I was proudly pulling back the bed covers to show them the mattress on one of the new twin beds I had bought and there it was snuggled under the covers. “Actually, Dad,” I replied, “I have noticed rather a lot of spiders recently, from lots of little spiders on the sofa to a white tail on my bedroom floor. Enough said! I spent the rest of the evening charging round the perimeter of my house spraying webs around the downpipes, vents, gutters, window sills etc. And then I went out to the shed. And, sure enough, there was a spider with a fat body (yikes, a redback?!) busily making a web in the hinge of the door. I didn’t dare look too closely. I just sprayed and ran. Then I sprayed the ledge of the laundry window only for a cockroach to jump out and fall into Bertie’s water bowl. Arghhhhh! Perhaps it’s time for me to pour a G ‘n’ T and let all thoughts of toxic nips or spaniel scratches just float away. Mind you, what about jellyfish in the sea? Should I worry about those too? More gin, anyone? There’s nothing like shifting up a decade to make you reflect on the past and think ahead to the future. Although getting older has its downsides, in other ways life gets easier: most of us wise up a bit, are less preoccupied with how we come across and whether people like us. We’re not so worried about how many exams we’ve passed and how high up the career ladder we’ve climbed. We know what we stand for, what we value most in life and whom we want to spend time with. I made a fuss of my recent big birthday and celebrated being alive, well and still on planet earth. But most of all, I celebrated family and friends, from ‘old’ friends in the UK to ‘new’ friends here in Australia. They are all part of who I am and who I have become, and I am so grateful for all the ways in which they have enriched my life. I received some wonderful birthday gifts, messages and cards with a few key themes emerging: tea, tea drinking and Britishness (Keep Calm and Have a Cuppa); jewellery, beautiful pottery, glass and ceramics; books, travelling and writing (a kindle, an oversize visual feast Lonely Planet book and a plaque of Charlotte Bronte, a great talisman (or should I say taliswoman?) to inspire my writing), and all things dog related (from a cocker spaniel mug to a book on dog behaviour). A very special friend from the UK, Monica, who I have known since we were both 14 – and I am singling her out because she is dealing with extremely confronting challenges in her family life – found time to send me a parcel containing a few of my favourite things. 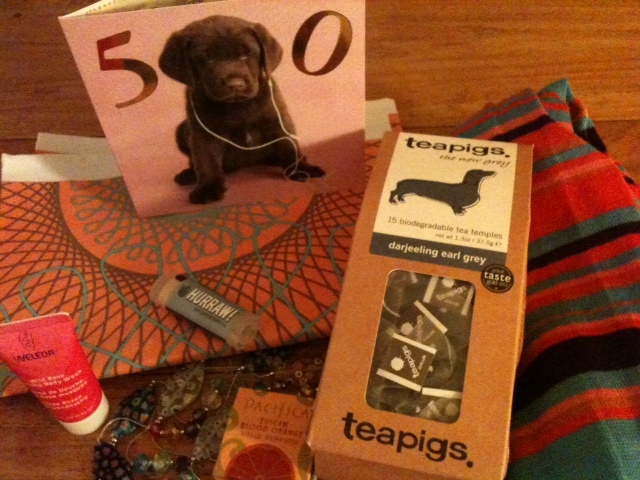 Bit by bit I unwrapped a packet of Earl Grey Darjeeling containing ’15 biodegradable tea temples’ from a company with a dachshund logo called teapigs, some Earl Grey lip balm (organic and vegan), a long striped scarf in vibrant colours, some Tuscan blood orange body balm (free of nasties and animal testing), a designer linen towel, some wild (English) rose shower cream, a gorgeous enamel necklace, photos from our younger days (yikes, what was I doing with permed hair?) and a card full of special messages and in-jokes featuring a chocolate Lab listening to his iPod. I was so touched and yet so sad she was not with me that I couldn’t help but shed a tear. And then I had a little soiree courtesy of my brother and his wife who generously opened up their house so I could mark my milestone with a few friends. And what an evening it was! 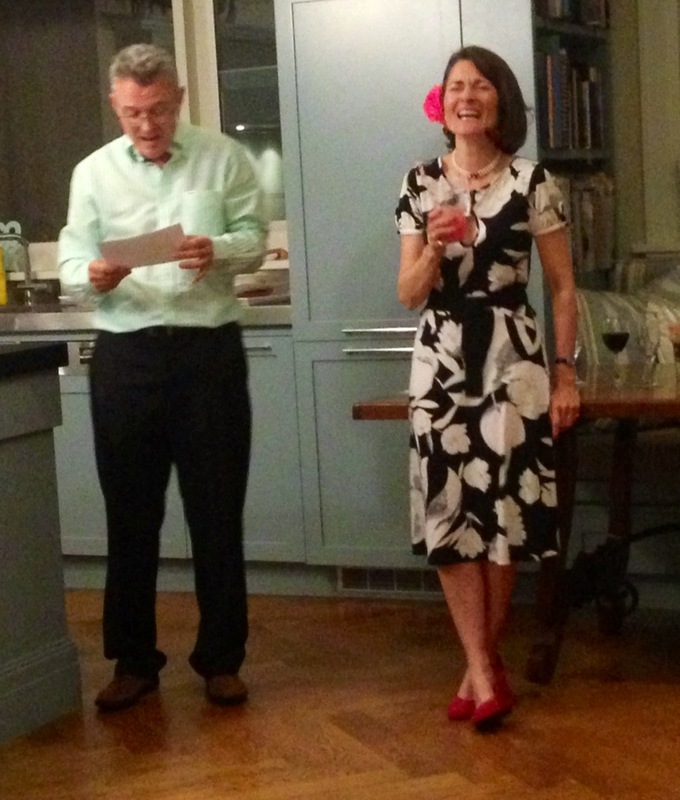 It was not only a celebration of my half century but also the culmination of nearly ten years in Australia. The whole evening was characterised by the warmest and most affectionate of vibes with my mother, sister and niece tuned in via Skype from their kitchen in London. And I needn’t have worried what my brother would say about his little sister; he made a wonderful speech full of childhood memories such as smashing our mother’s best tea set, rolling down bracken-covered hills and driving up icy hills in Derbyshire. He went on to acknowledge my academic and professional successes at the same time lamenting my disasters with men and dating. Thank God for Bertie dog, he concluded. And then, as a complete surprise, my friend Rosi, whom I met in choir, bravely took centre stage (well, I could hardly hog it ALL evening) and sang to me her specially written version of These Are a Few of My Favourite Things. Cleverly, with all the verses rhyming, she wove in references to my being a striving self-helper and writer with a stiff neck habit, a fan of the Feldenkrais method and Ayurvedic practice, a not-for-profit grant-writer, a Bayside-dwelling, literature and dog-loving Brit with a fatal attraction for the wrong kind of men. It was the most affectionate warts ‘n’ all tribute one would wish for. Never have I felt so loved and appreciated. For once I was not the singleton at the wedding, the wallflower at the dance, the outsider at the new school or the new kid in town. It was my party and I could float around like a Queen if I felt like it (my friend Tim from Hepburn Springs actually alluded to me and Her Maj in the same sentence, although I doubt Liz would wear fake flowers from Sportsgirl in her hair…). Surrounded by loving friends and family, I realised like never before that it really was OK to be me – imperfections, hang ups, trials, tribulations, triumphs, the whole shebang – and still be loved and lovable. And as for the men, well I’ve still got up to 50 years to change the pattern (we are, of course, living longer and longer). Meanwhile, as American singer and song writer Carrie Underwood is reputed to have said: “The more boys I meet, the more I love my dog.” Thank God, indeed, for beautiful Bertie. Ladies and Gentlemen please raise a toast to my devoted hound.